Plan the location and length of the incision as carefully as the fixation. The fixation is temporary, the scar permanent. Children are often embarrassed about their scars, even when they become adults. Not infrequently, scars from surgical procedures cause children to avoid such sports as swimming, running, or basketball that require clothing that exposes the scar. Make the scar as inconspicuous as possible by limiting its length and making the incision in the least noticeable location that allows adequate access for the procedure. Try to avoid incisions that are known to cause bad scars. Several techniques will be useful in reducing the disability from operative scars. Shorten scars Make a short incision exactly over the site of the procedure. Before the skin prep, mark the position for the osteotomies using fluoroscopy. Least conspicuous position Use the axillary approach for the upper humerus, the anterior approach for draining the hip, etc. Avoid incisions that cause wide scars For example, avoid making the vertical portion of the Smith–Peterson approach. To achieve the same exposure, extend the incision more medial in the bikini line. This provides adequate access with a much more cosmetic outcome. Likewise, avoid incisions over the clavicle. Make the approach below the clavicle even if a longer incision is necessary. Consider the anterior midline longitudinal incision for major knee procedures. The scar is more cosmetic, and if additional procedures are required later, the same approach can be used to avoid multiple knee incisions. Bilateral procedures Mark the position and scar length before preparing the skin. Anticipate that the patient and family will compare the two scars later. Asymmetrical scars for the same procedure create doubt about the precision of the surgeon. Short incision with mobilizing skin allows satisfactory exposure with minimal incision length. Close the skin with subcutaneous absorbable sutures. Skin closure can be done quickly. 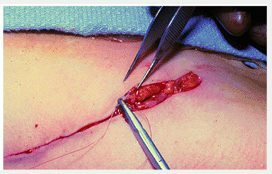 Place a few subcutaneous sutures, and close the skin with subcuticular 3-0 absorbable suture. Supplement this closure with skin tape while approximating the skin edges by applying traction on both ends of the suture. The suture ends are cut off flush with the skin. This closure technique is rapid and definitive. For incisions that are or will be under tension, close with 4-0 interrupted nylon sutures placed relatively close to the incision. Remove the sutures in 7 days. Avoid wide sutures to minimize the scar.